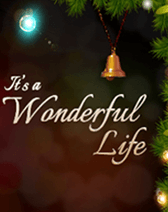 A professional adaptation of Frank Capra's It's A Wonderful Life, the play is a traditional stage drama based on the short story and booklet The Greatest Gift, which Philip Van Doren Stern wrote in 1939 and published privately in 1945. The play is based on the fictional character of George Bailey. The character is a building and loan banker who sacrifices his dreams in order to help his community, to the point where he feels life has passed him by. Eventually, due to a cruel business rival's manipulations, Bailey falls into despair so deep that he contemplates suicide, until his guardian angel, Clarence Odbody, gives him a valuable perspective on the worth of his life. A classic holiday season presentation you wont want to miss.